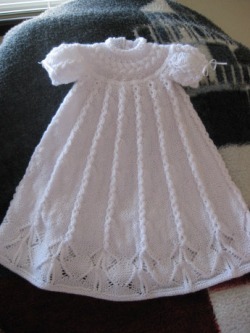 If you are interested in purchasing the original model (newborn size), it is available for $95.00 USD. This would include shipping costs (at this time can only ship to locations within the contiguous United States). I can only offer returns if the purchaser pays the return shipping as well as my original shipping costs. Please contact me at lambknitj@juno.com if you are interested in purchasing the model, and I can arrange for purchase through Paypal. Difficulty Level: Experienced (use of short row shaping, and herringbone braiding – but don’t be afraid to try it, as I have tried to explain how to do both in the instructions). 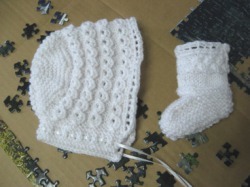 Gauge: 5 ½ sts/inch in stockinette stitch. Size: Newborn. Inc – increases are made by purling into the front and back of a stitch. Repeat on next row, except purl each stitch instead of knitting – continue to bring yarns from underneath on each st.
Work across, repeating row 1 over next 24 sts (don’t forget to count the slipped sts that are passed over the others – they still count in the stitch count!) These sts will be the Right Back. Break yarn, leaving a long tail, about 1 yard. Row 3: p11, (k3, p8) three times, end p3. Row 4: k11, (p3, k8) three times, end k3. Row 5: p11, (sl 1 wyib, k2, psso, p8) three times, end p3. Repeat rows 2-5 once more, then work row 2 again. With long tail from Right Back, pick up 6 sts from underarm of sleeve just worked, then work across next 51 sts for Front continuing with Row 1 of Pattern Setup. Drop tail. Pick up tail again, pick up 6 sts from underarm of second sleeve, then work remaining 24 sts of Left Back, continuing with Row 1 of Pattern Setup. Do not turn. Slip marker and continue. Row 1 (right side): (p7, sl 1 wyib, k2, psso) around. Row 2: (p7, k1, yo, k1) around. Row 3: (p7, k3) around. Row 4: (p7, k3) around. Continue in these four rows of pattern as set, working in rounds. Make increases on next row as follows: inc in purl st on both sides of every cable. New sts will become purl sts added in to each side of cable. Weave 14-16” length of ribbon through eyelets on each sleeve, and tie in a bow.